Are you curious about the Wing Chun Kung Fu System? You probably have done some research on this very topic and have read countless articles of its origins, lineages, styles, political squabbles, and different families. There are also numerous schools with its adjective label descriptions of the Wing Chun style: traditional, classical, authentic, applied, modern, combative, pure, etc. You will even find various spellings of the name from different families: Ving Tsun, Ving Chun, Wing Tsun, Wing Tzun, Weng Chun, Wing Choon, Weng Choon and others. If you are someone new to this fighting and self-protecting art it does get quite confusing as to the type of school that will give you the best Wing Chun experience. They may all be the best but what you have to determine is what school is the best for you. The Wing Chun School in Virginia Beach taught by Sifu Gorden Lu who is the grand nephew to the Wing Chun Grand Master Ip Man (Bruce Lee’s teacher), and his only living relative in the United States teaching Wing Chun. Sifu Gorden provides a unique learning experience in this martial art. When you first meet Sifu Gorden you will be impressed by his insight and knowledge of Wing Chun. His wealth of knowledge comes from a life long experience of training with his father Lo Man Kam along with concurrent years of training from Shiu-Hung (Duncan) Leung – the founder of Applied Wing Chun. Both Lo Man Kam and Duncan Leung are direct disciples of Ip Man. Sifu Gorden’s school is always open to newcomers and welcomes all visitors to observe the classes. He explains to prospective students that he teaches how to fight and protect yourself based upon our nature reaction, scientific effects and strategies. This is done by training your body motion, muscle memory, Wing Chun theory and reflexes to instinctively react to adverse attacks. Wing Chun theory combines elements of motion, position, timing, space, strategy and energy into an efficient and effective fighting system. Sifu Gorden emphasizes the importance of protecting yourself by learning how to cover an opponent’s attacks. Hitting is easy. The ability to avoid being hit is what takes skill and practice. Sifu Gorden will stress to beginners the importance of proper Wing Chun structure and movement. He firmly believes that you must first learn how to stand, turn and walk correctly and understand the basic ideas in Wing Chun before you start learning any techniques and drills. The most important form of Wing Chun system is first form; also, called Siu Lim Tau (Little Imagination or little idea) is taught immediately to new students. The first form is always performed by all students at the beginning of each class in a steady and relaxed pace. Speed is not essential in the first form. The essentials include the proper horse stance, precise arm and hand positions, and direction/delivery of power. Special attention is given to the first form because most of the movements are incorporated in the techniques and drills in Wing Chun. Sifu Gorden will correct his students and continually improve their form and techniques no matter what their skill level may be. He will further explain each movement and elaborate in its applications and usefulness. What students will find refreshing about Sifu Gorden is his willingness to answer any questions. 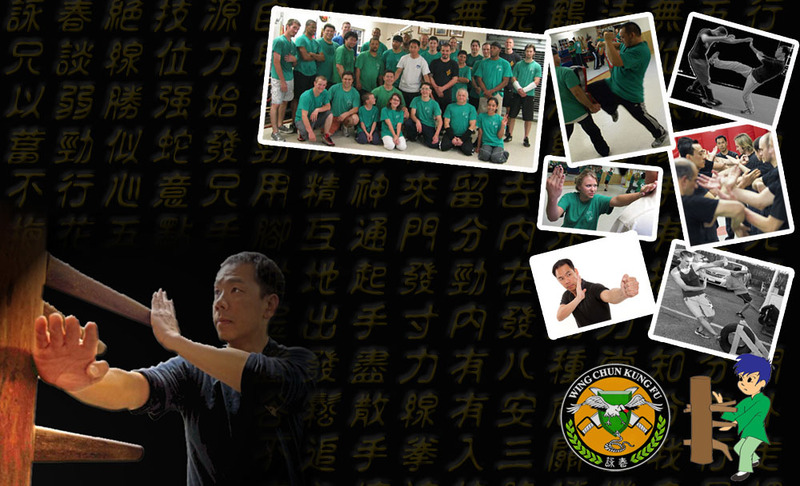 He professes no secrets in Wing Chun and offers a learning environment that is open and friendly. This fosters an atmosphere of respect and diligence among his students. There are no belts or sashes to signify a student’s level. The progression of a student is determined by the amount of time, work, effort and practice an individual puts in to master a technique or drill. As you advance through the class, you will learn to combine the basic movements into technical drills that will be used during sparring, circle fighting training, Chisao, timing exercises and other drills. A series of power exercises or Wing Chun supporting exercises are done at the end of most class that is used to enhance the Wing Chun techniques and aid in the development of proper muscles, structure, stability, flexibility, improve fitness and endurance. The Virginia Beach and Norfolk area is rich with martial arts schools such as Tae Kwon Do, Karate, Kempo, Kali, Escrima, Jiu Jitsu, Judo, Aikido, Hapkido, Kendo and Kick Boxing just to name a few. Sifu Gorden enriches the areas martial arts community by providing quality Wing Chun Kung Fu experience to any person that is interested. His school is located at 3878 Holland Rd, Virginia Beach. It is also a convenient commute from neighboring cities such as Newport News, Hampton, Norfolk, Chesapeake, Portsmouth and Suffolk. His regular students come from diverse backgrounds and professional disciplines such as college students, civil servants, engineers, graphic designers, Navy sailors, commercial and defense contractors, local law enforcement, medical technicians and network specialists…Returning and visiting students also come from difference places in US and difference countries. Sifu Gorden understands that each individual is unique and will eventually develop his/her own expression of Wing Chun. His goal is to ensure that his students are given the same quality of lessons as was handed down to him by his Sifus. Hopefully this article gives the reader a brief insight and perspective of what to expect from Sifu Gorden and his school. There are no flashy labels to his Wing Chun other than it is practical and applicable. So if you are interested in Wing Chun Kung Fu, please find the time to visit Sifu Gorden’s school and observe the class. He and his students will be available to answer any questions that you may have concerning Wing Chun.